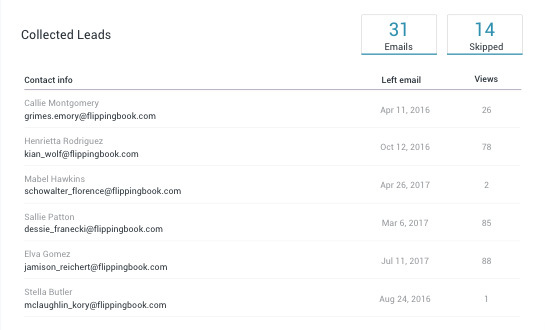 With FlippingBook, you can see beyond simple downloads and discover valuable information about your document performance and viewers. Knowing how people use your content opens up numerous possibilities for improving it and better communicating with your audience. 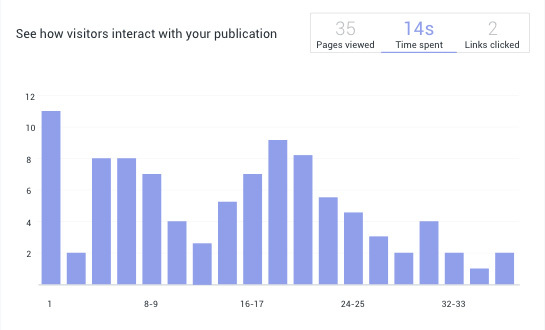 Track the number of people and total views your publications drive. Find out what parts of your document are the most engaging. Learn if viewers have a quick scan of your publications or a thorough look. This metric is closely tied to lead generation. Once a viewer leaves their email through the lead capture form, you’ll know if and how often they open the document. If you need advanced data such as demographics or visit locations, you can use our simple integration with Google Analytics.